Dog Trainer. Zoologist. Sailor. Mom. I'm a Certified Professional Dog Trainer (CPDT-KA), one of only 11 on Vancouver Island, a Licensed Educator for the Dogs & Storks®, and Dogs & Toddlers programs, and a graduate from The University of Nottingham where I specialized in Animal Behaviour. Why I chose Dog Training over Wildlife Conservation. I remember when I was 14 being asked what I wanted to do when I left school. Easy, "I'm going to be a wolf biologist" I replied. The lack of wolves in the UK didn't hinder my chosen career plan, though my teacher telling me I wouldn't be able to work in Canada because I couldn't speak French, did make me cry, a little. Today B.C. has been my home for the last 11 years. I still can't speak French, but I have been privileged enough to work on a couple of really interesting wolf related projects, in some very beautiful parts the world. Life as a Zoologist took me to some wonderful and wild places. I've lived in Mongolia, studying the wild Przewalski Horses, worked on various wildlife rehabilitation and habitat restoration projects in both New Zealand and the UK, and I've spent time in Churchill, Manitoba - living on a decommissioned missile base on the edge of polar bear country! I've also sailed up and down the coastline of B.C. looking for marine mammals, bears, and wolf poop! Sounds like a dream-career come true, right? It was, but something was missing. I loved working on remote field projects but there were very few opportunities for me to implement a positive change. I really did want to create a better world, I just needed to find a better way to do it. I went back to school, putting my animal behaviour credentials to great use, and spent the next few years working towards my Professional Dog Trainer certification (CPDT-KA). Off Track was launched in the Spring of 2011, with the mission to create a better life for my clients, both two-legged and four. In 2017 my daughter, Georgia, was born, bringing a new and exciting chapter to Off Track. Becoming a Mom gave me the perfect opportunity to focus my skills, and share my experiences and knowledge in this specialized area of family dog training. Though I'm no longer on the front line of conservation efforts, my work through Off Track has enabled me to financially support a couple of small organizations that truly are making a big difference in the world: Nurture Project International, and the Raincoast Conservation Foundation. Wanna join a global movement? Check out 1% For The Planet. Becoming a Mom changed everything. It wasn't until my daughter was born that I realized how underprepared my dog actually was for her arrival. 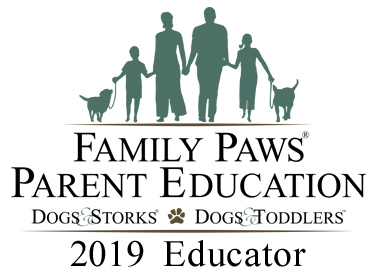 Thankfully my maternity leave plans involved joining Family Paws, and becoming a Licensed Educator for their Dogs & Storks, and Dogs & Toddlers programs. I was blow away by how much I didn’t know. Since 2017 I now specialize in helping families. BCSPCA Animal Behaviour Science Symposium. Dr Sophia Yin. Welfare & Handling. Nicole Wilde. Working with Fear Aggression. In order to better help the families I work with, I'm looking into Postpartum Doula training. 1. I grew up with 17 dogs, ranging in size from 10lb to 90lb. Not all at the same time! 2. I've covered the coast of B.C. in a sail boat, but I've never been to the Okanagan. 3. I was born in England, but tell everyone I'm Cornish. 4. I prefer to drink cider over beer (because I'm Cornish). 5. I've played Field Hockey, Ultimate Frisbee and Roller Derby. 6. I can carve a birdhouse from a log using a chainsaw. 7. I can say “hello” in Mongolian....as well as “I would like a shower please”. Dog & toddler worries keeping you from enjoying family time?